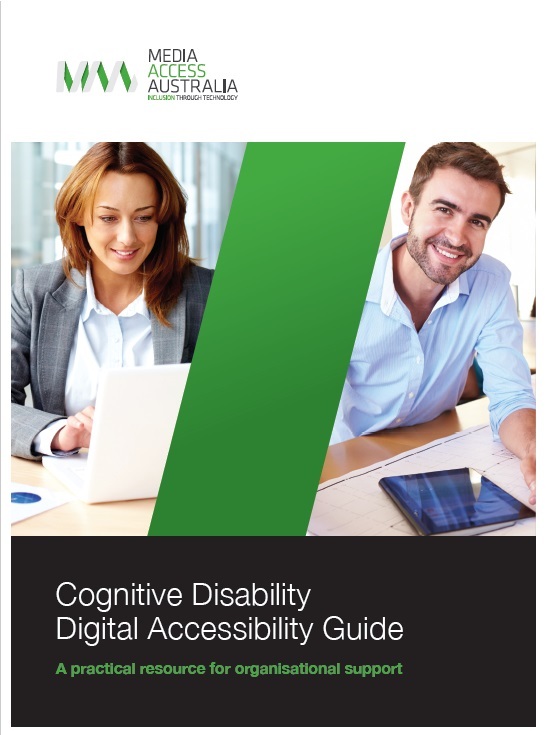 The Cognitive Disability Digital Accessibility Guide was created by Media Access Australia to provide guidance on how best to address accessibility-related issues for people with cognitive disability in a media context. It comes from an often expressed need from organisations for specific information around how best to accommodate and interact with people who have a cognitive disability. This new booklet is a companion piece to the ‘Service Providers Accessibility Guide’ from late 2015. It has been designed to deliver practical, step-by-step information in order to enable best-practice web and digital communication to be prepared and then delivered in an inclusive and effective way. There are a number of disabilities where a cognitive disability may be a significant factor for an individual. Such disabilities include acquired brain injury (ABI), autism, dementia, developmental disability, Down syndrome, intellectual disability and traumatic brain injury (TBI). There are other disabilities where people may have a cognitive disability, such as attention deficit disorder (ADD), dyslexia (difficulty reading), dyscalculia (difficulty with maths) and learning disabilities in general. The guide explores traditionally-implemented accessibility guidelines of WCAG 2.0 Level AA as well as looking at the increasing relevance of Level AAA requirements. This includes the need to ensure that a quick reference sheet is written to a lower secondary education level of simple English, along with the need to define abbreviations and acronyms. The guide also delves into the role of affordable consumer devices such as tablets and helpful apps. I understand and accept that I may be emailed about an update to this guide or a related guide from Media Access Australia, at some stage in the future. By clicking submit, you also accept to recieve our MAA newsletter, which you can unsubscribe from at any time. For enquiries about this guide please email accessibleservices@mediaaccess.org.au or call 02 9212 6242.